Download "ELIZABETH K. MCWEENY, M.S., CCC-SLP University of Arkansas at Little Rock University of Arkansas for Medical Sciences"
1 ELIZABETH K. MCWEENY, M.S., CCC-SLP University of Arkansas at Little Rock University of Arkansas for Medical Sciences EDUCATION: M.S. 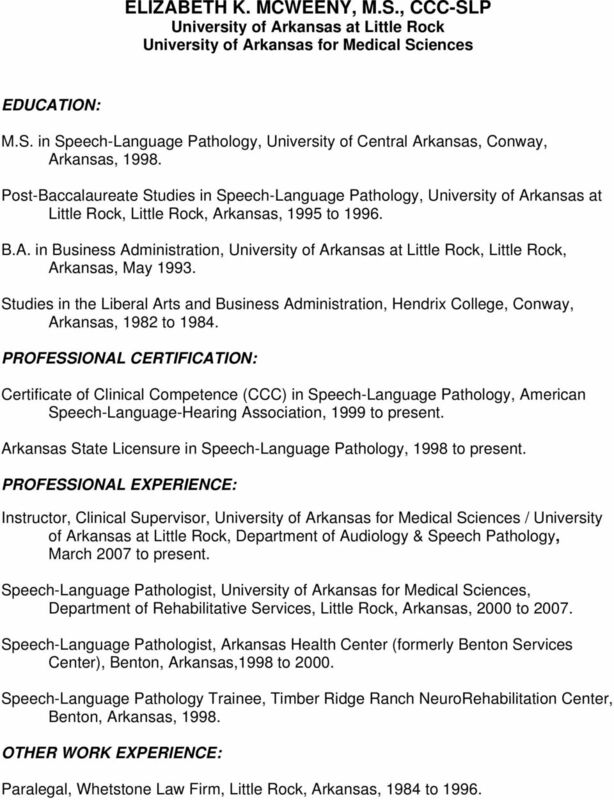 in Speech-Language Pathology, University of Central Arkansas, Conway, Arkansas, Post-Baccalaureate Studies in Speech-Language Pathology, University of Arkansas at Little Rock, Little Rock, Arkansas, 1995 to B.A. in Business Administration, University of Arkansas at Little Rock, Little Rock, Arkansas, May Studies in the Liberal Arts and Business Administration, Hendrix College, Conway, Arkansas, 1982 to PROFESSIONAL CERTIFICATION: Certificate of Clinical Competence (CCC) in Speech-Language Pathology, American Speech-Language-Hearing Association, 1999 to present. 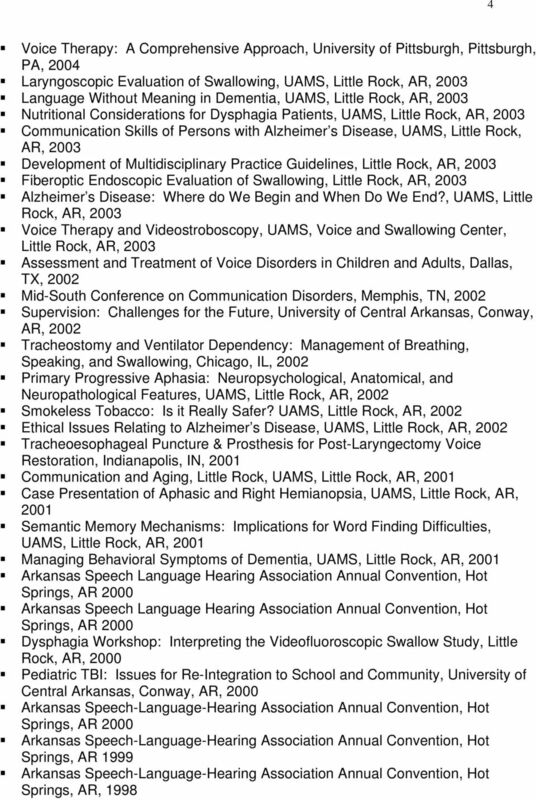 Arkansas State Licensure in Speech-Language Pathology, 1998 to present. 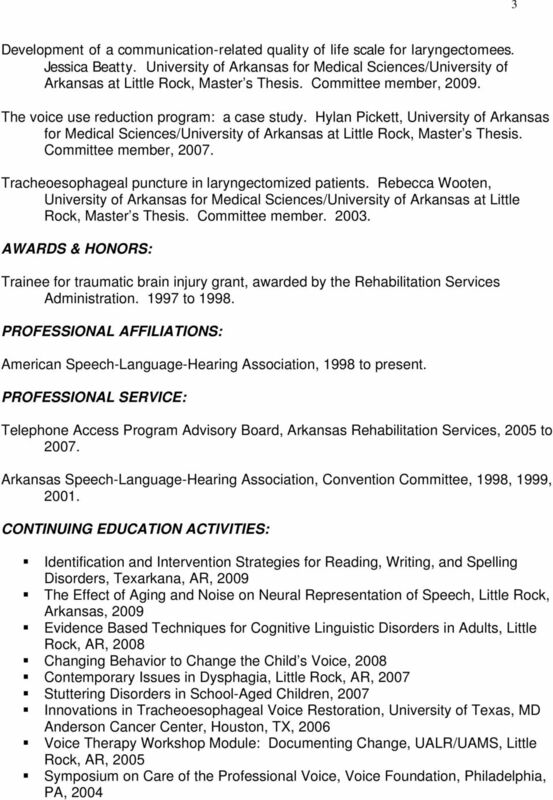 PROFESSIONAL EXPERIENCE: Instructor, Clinical Supervisor, University of Arkansas for Medical Sciences / University of Arkansas at Little Rock, Department of Audiology & Speech Pathology, March 2007 to present. Speech-Language Pathologist, University of Arkansas for Medical Sciences, Department of Rehabilitative Services, Little Rock, Arkansas, 2000 to Speech-Language Pathologist, Arkansas Health Center (formerly Benton Services Center), Benton, Arkansas,1998 to Speech-Language Pathology Trainee, Timber Ridge Ranch NeuroRehabilitation Center, Benton, Arkansas, OTHER WORK EXPERIENCE: Paralegal, Whetstone Law Firm, Little Rock, Arkansas, 1984 to 1996. 2 2 SPECIAL AREAS OF INTEREST: Laryngectomy rehabilitation, voice, swallowing, clinical supervision. 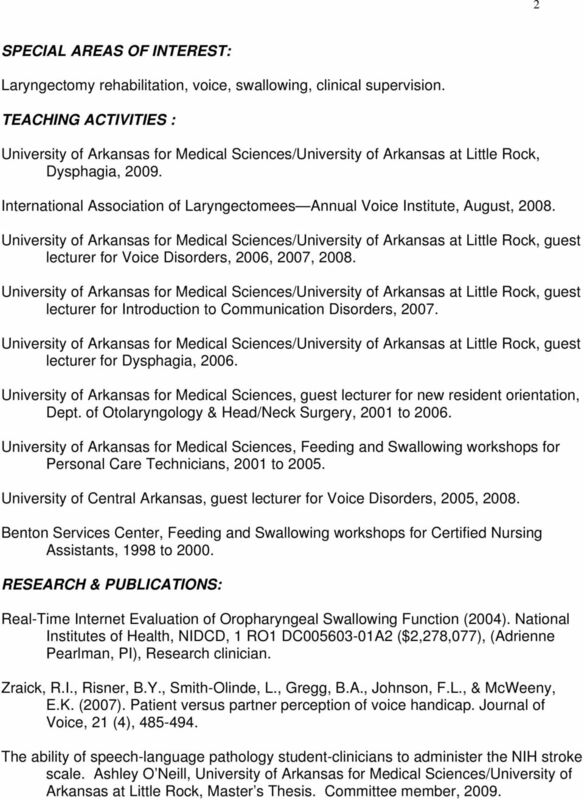 TEACHING ACTIVITIES : University of Arkansas for Medical Sciences/University of Arkansas at Little Rock, Dysphagia, International Association of Laryngectomees Annual Voice Institute, August, lecturer for Voice Disorders, 2006, 2007, lecturer for Introduction to Communication Disorders, lecturer for Dysphagia, University of Arkansas for Medical Sciences, guest lecturer for new resident orientation, Dept. of Otolaryngology & Head/Neck Surgery, 2001 to University of Arkansas for Medical Sciences, Feeding and Swallowing workshops for Personal Care Technicians, 2001 to University of Central Arkansas, guest lecturer for Voice Disorders, 2005, Benton Services Center, Feeding and Swallowing workshops for Certified Nursing Assistants, 1998 to RESEARCH & PUBLICATIONS: Real-Time Internet Evaluation of Oropharyngeal Swallowing Function (2004). National Institutes of Health, NIDCD, 1 RO1 DC A2 ($2,278,077), (Adrienne Pearlman, PI), Research clinician. Zraick, R.I., Risner, B.Y., Smith-Olinde, L., Gregg, B.A., Johnson, F.L., & McWeeny, E.K. (2007). Patient versus partner perception of voice handicap. Journal of Voice, 21 (4), The ability of speech-language pathology student-clinicians to administer the NIH stroke scale. Ashley O Neill, University of Arkansas for Medical Sciences/University of Arkansas at Little Rock, Master s Thesis. Committee member, 2009. Procedure code billed is not approved for the therapy/pathology assistant.